The festival odyssey for former UCLA graduate film student Farzad Sangari began this summer in Washington, D.C. With some degree of prestige, as the Saturday June 19th screening debut of Mudbloods was hosted by the AFI Docs festival. It’s an exciting opportunity to hear from up and coming directors and see their films before anyone else. These filmmakers will be the big names of tomorrow, and you’ll be able to say that you saw them first in Palm Springs. 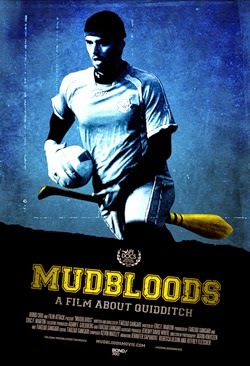 Sangari's documentary follows the fortunes of UCLA's Harry Potter Quidditch team as it aims in 2011 to make it to the sport's fifth annual World Cup in New York City. For now, most people in the HP-know likely still associate the term "Mudblood" with its original, Hogwarts-derogatory meaning. E.g., "a Muggle-born wizard or witch with no wizarding parents or grandparents." Sangari's film is scheduled to hit DVD/VOD October 14th. He and several guests will be in the desert Monday for a Q&A.